I began this blog a few years ago. I figured it would be a great way to record my everyday life and to practice and improve my writing talent. I had no idea it would become a close network of friends I’ve never met before. I look forward to reading everyone’s posts and get excited when someone new visits, likes or comments on one of my posts. 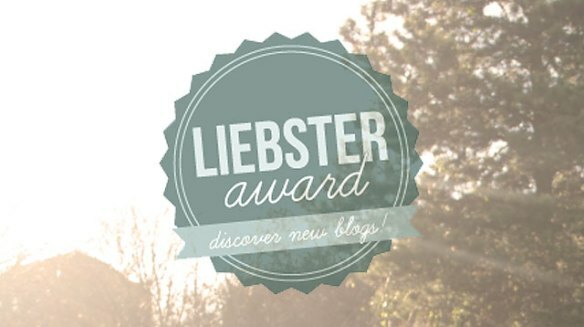 I was pleasantly surprised to discover that this week I was nominated for The Liebster Award by Greg over at Why I runDisney – thank you so, so much! I feel like I have officially been welcomed into an extended blogging community! 1. What is your favorite Disney theme park in the world? Why? My favorite Disney theme park in the whole world by default is Walt Disney World in Orlando, Florida. Not only is it the ONLY Disney theme park I’ve been to (the first time when I was 12 years old), it’s where I worked, played and lived for a year during my Disney College Program. It’s where I met some of my very best friends, now extend members of my family. It’s where I met my boyfriend, Scott. It’s where I truly found me. 2. Are there any Disney theme parks that you would like to visit that you haven’t visited yet? If so, which one(s)? Someday I would love to visit Disneyland and California Adventure. I would also like to visit one of the international parks, I’m not picky about which one because honestly, if I had an unlimited bank account, I’d love to visit them all!! 3. Since all of you have run in races before, which race was your favorite? 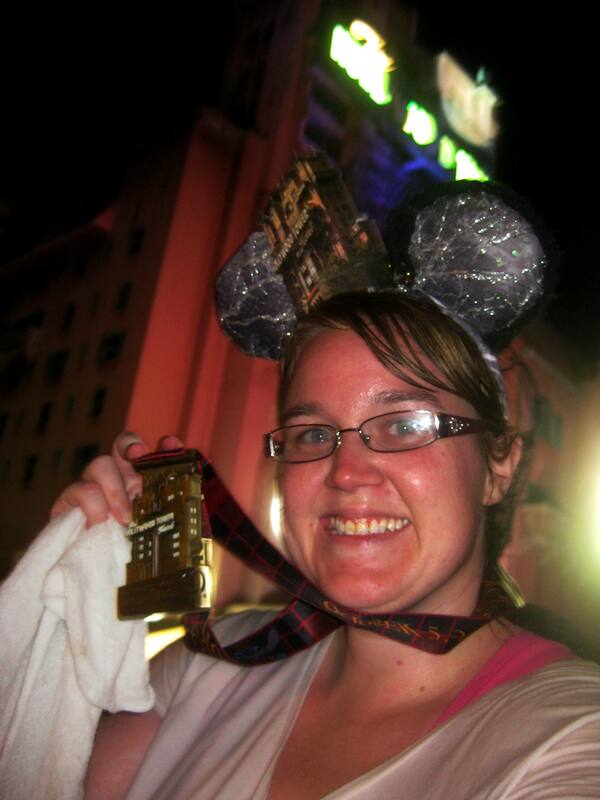 My favorite race was the 2013 runDisney Tower of Terror 10 miler. 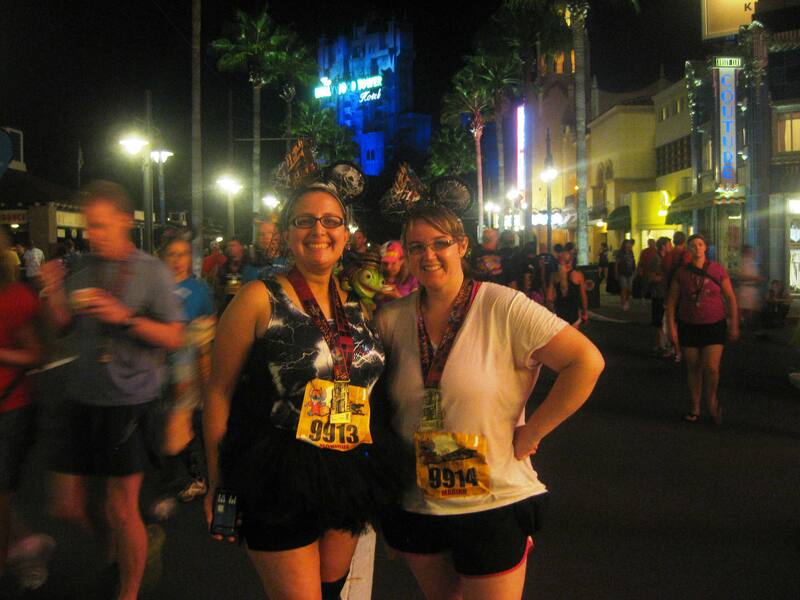 This was my third runDisney race that I’ve run with my DCP roommate, Monique. It was also the longest distance I have ever pushed myself. I’ve never been so proud of myself before this moment. Crossing that finish line for me was so emotional, so overwhelming, so powerful. Once we crossed the finish line Monique was already talking Wine and Dine Half 2014, which we will be running in November, so my favorite race may change! 4. 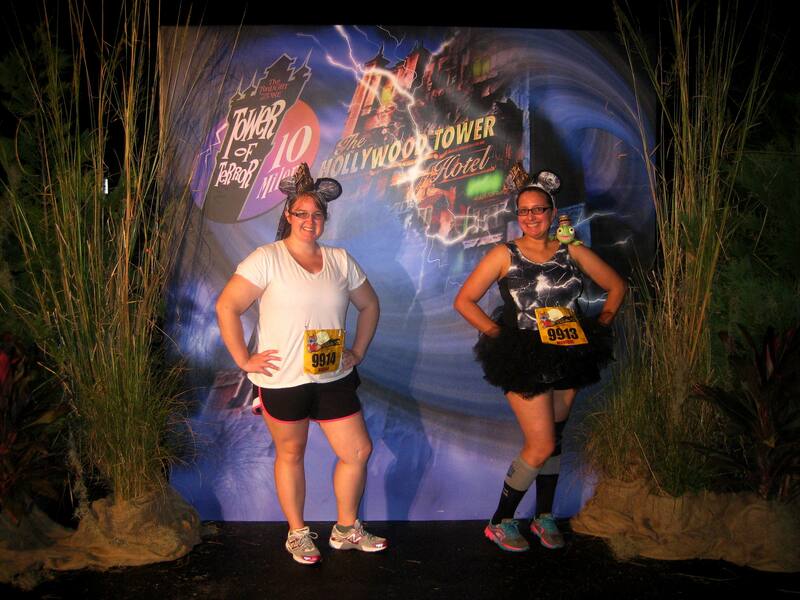 If you could choose a theme for a runDisney race, what theme would you choose and why? 5. What advice would you offer someone who is a beginning runner? It does not matter if you run the whole time or only for a minute, as long as you run at some point, YOU are a runner. I know it’s hard not to compare yourself to others (trust me on this, I struggle with it daily it seems like), but the only person you should be comparing yourself to is the you from YESTERDAY. When I began my running journey, a seasoned runner told me that I would go through an emotional journey, I would have good days and bad days, days when my lungs and legs would burn, but if I kept pushing, not only physically, but mentally as well, I would reach every running goal I set for myself. I know I’ll never be the fastest, but as long as I finish, that is a win and a major success and accomplishment in my book. 6. What races are on your bucket list? 7. If you run with music, what are your favorite songs to run with? If you don’t run with music, what is your favorite mantra? 8. What are your favorite Disney theme park indulgences? This could be favorite food items, favorite shows, favorite attractions, favorite places to go while on a Disney theme park vacation, etc. In other words, what are your favorite things to do at any of the Disney theme parks? Wow, I’m not sure I can narrow that down, especially since I just returned from the Happiest Place on Earth. Can I say everything?! Okay here goes – at Animal Kingdom: Finding Nemo: The Musical, Dinosaur, Expedition Everest, and when they still had it, the Shrimp Po Boy sandwich at Restaurantosaurus. Epcot – Spaceship Earth, Test Track, Soarin’, walking around World Showcase, especially during the International Food and Wine Festival in the fall, and watching Illuninations, the best place in my opinion is from the Mexico Pavilion. Hollywood Studios – Rock N Roller Coaster, The Great Movie Ride, Indiana Jones Stunt Show, a new favorite is the character drawing class in the Animation Building, and Fantasmic. Magic Kingdom – Meeting Mickey, Jungle Cruise, Pirates of the Caribbean, The Haunted Mansion, Space Mountain, People Mover, Monster’s Inc. Laugh Floor, Festival of Fantasy parade, Wishes, and eating at be Our Guest. Also, if you are lucky enough to got to a Mickey’s Not-So-Scary Halloween Party or Mickey’s Very Merry Christmas Party, DO IT, you won’t be disappointed, I promise! I also enjoy riding the monorail and watching Wishes from the roof of the Contemporary Resort and from the beach at the Polynesian Resort. If you are ever at Downtown Disney, eat at Earl of Sandwich, get a chocolate milkshake from Ghirardelli and if your looking for something completely different, spend a few hours at Disney Quest. 9. When training for a race (a 5K, 10K, Half Marathon, Full Marathon, or Ultra), where is your favorite place to run? There is a state park not far from where I live that has a nice path out over the dam – down and back is just under 3 miles, it’s also a slight incline. I also enjoy running around the roads where I live – hilly country back roads, around the “block” is 3.5 miles. 10. If you could personalize the post race food given to you after a race like a half marathon or full marathon, what would your order? As I haven’t run a half marathon yet, I’m not sure what they give you. But when I get back from my training runs I always want chocolate milk after my bottle of water. Now for the fun part, my questions for the nominees should they choose to accept it! 1. What is your favorite quote/poem/motivational saying? 2. If you could visit any country in the world and stay for as long as you wanted, where would you go and why? 3. What was your favorite Disney movie as a kid? Is it still your favorite? 4. Tell me about a “hidden gem” in your town, something a tourist would never know to look for! 5. What are the 5 most played songs on your iPod/MP3 player/computer? 6. What are you most looking forward to this summer? 7. How many times have you been to the Disney Parks? 7.1 Share a Disney memory! 8. What is your favorite thing about blogging? 9. If you could have any role in a movie, what would it be? 10. What is the farthest you’ve ever traveled from home?